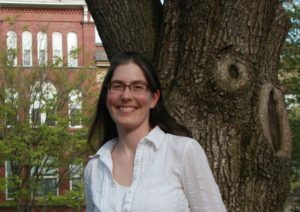 Shemariah Blum-Evitts, a farmer, regional planner and project manager is now the Program Director for Land For Good. Shemariah will direct all of the organization’s education, consulting, and research, as well as its direct service to New England farmers looking to access land, plan for farm succession, and obtain more secure land tenure. 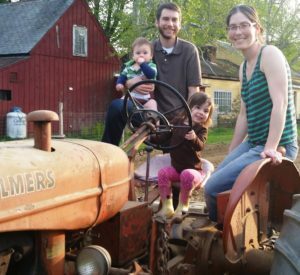 Shemariah Blum-Evitts, Program Director for Land For Good, on her family farm in South Deerfield MA. Supporting farmers and farmland owners around accessing and transferring farmland and farms is critical in the region. Nearly 30% of New England’s farmers are likely to exit farming in the next 10+ years, and 92% of these 10,369 senior farmers do not have another farm operator working alongside them. (Gaining Insights) While this does not mean that these farmers don’t have a succession plan, it does suggest that the future of many of farms is uncertain. This land and agricultural infrastructure will change hands in one way or another over the next decade. What these farmers do with their land and other farm assets as they exit farming will shape New England’s agricultural landscape for generations to come. A farmer herself, Shemariah was also the founder and Program Manager of New Lands Farm with Ascentria Care Alliance from 2008-2015. The program, which she initiated and built in collaboration with community partners, offered training and land access to New American farmers in Central and Western Massachusetts seeking community gardens, farming enterprises and technical assistance. Shemariah studied land use and agricultural planning while gaining her Masters in Regional Planning from UMass Amherst. Her thesis developed a foodshed assessment model to map current and potential working farmland and farmland capacity. She believes strongly in the importance of working farms. Since 2004, she has been working on and managing farms in GA, TX, CT and MA. 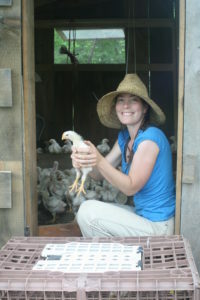 She and her husband operate their own small-scale, kosher, pastured poultry operation on their home farm in South Deerfield MA. As Program Director for Land For Good, Shemariah will work with LFG Field Agents on the ground in each state to provide direct assistance and training to farmers, farm families and farmland owners who are seeking land, planning a farm transfer or wanting to make land available for farming. She will collaborate on projects with regional partner organizations to deliver programs and assistance. Kathy Ruhf, currently Land For Good’s Senior Program Director, will become Senior Advisor and focus on staff mentoring and strategic advising, along with selected project management and consulting. Shema brings the skills and experience that are a great fit for this position and our team. Her farming and program work on farms with diverse populations will enrich and deepen our work. We’re excited to have her – and another farmer – on our team,” says Jim Hafner, Executive Director. Shema will work with many organizations and agencies in the region that are already cooperating on land access and farm succession education, technical assistance, and policy. In Massachusetts, these groups include among others the Massachusetts Department of Agricultural Resources (MDAR), New Entry Sustainable Farming Project, Southeastern Massachusetts Agricultural Partnership (SEMAP), Community Involved in Sustaining Agriculture (CISA) and other buy local programs, Massachusetts Farm Bureau, the land trust community, and the MA Food System Collaborative.